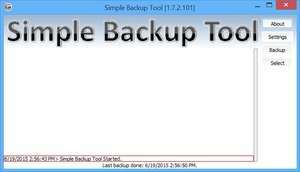 Simple Backup Tool is, as its name may suggest, a program which provides an uncomplicated way to backing up data on a Windows system. It can back up specific files and folders on your PC. The application interface of Simple Backup Tool is not too difficult to understand which provides several different options to customize it. The main settings include specifying target and source folders, filtering files if desired and what to do after backup has completed: Archive backup folder after backup complete, Add a date to archive filename and the option of removing older files based on number of days. Version 1.7.2.101 is a freeware program which does not have restrictions and it's free so it doesn't cost anything. For security reasons, you should also check out the Simple Backup Tool download at LO4D.com which includes virus and malware tests. Additional screenshots of this application download may be available, too.